He is everything she should run from, hide from and fear, but Dax is the man Ella has always dreamed of and longed for. As she works the bar she owns every night. How can life be so unfair? C.J. Burright’s latest addition to the Dreamcaster series is one beautifully chaotic ride. 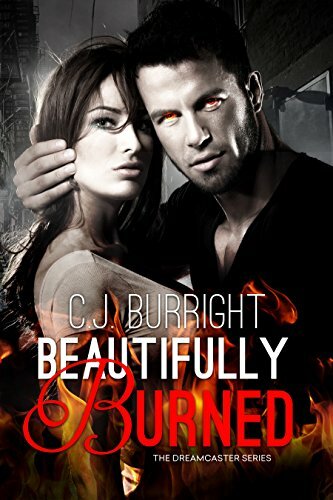 Beautifully Burned is a tale of love, struggle and determination. When danger comes from a dark entity, Dax may be the only thing that keeps Ella alive and that is so not his normal MO. Ella is a Dreamcaster and Dax must feed off nightmares, like a vampire feeds off humans, draining them of the precious liquid. Gruff, ill-tempered Dax has no time for emotions, but Ella’s need and compassion both erode his prickly façade. Can he learn to trust in Ella? Can he learn to let another into his life? His is a mess, but Ella is determined to show him the good lies within while hoping she can also claim a piece of his heart. Fall into a dreamlike tale as C.J. Burright builds a world that straddles reality and a magical world few know of. From scene to scene, the growth and changes in some of the characters is remarkable as one outwardly tough woman and one outwardly standoffish man find a one in a lifetime relationship that dreams are made of. Beautifully written by C.J. Burright, wildly creative and unique, Beautifully Burned is a gem that sparkles bright! I received an ARC edition from C.J. Burright in exchange for my honest review.